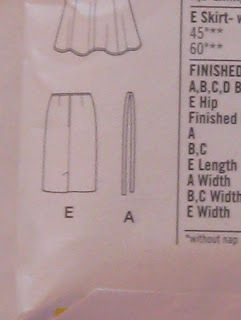 This skirt (view E) is my project for February. I have decided to sew one new thing each month this year, and since January is so crazy busy, I am starting goals in February. I'll make up for January at some point before the end of the year. Here is a line drawing of the back. Pretty simple. I have had this fabric for about a year and a half. I got it at Jenny's in Fountain Valley. I love that store. 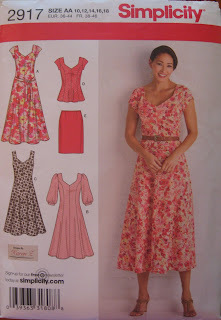 I'm going there soon to look for a Hawaiian print for a BBQ apron for the husband. Anyway, this fabric has several flaws, and the selvage is kind of wavy. The flaws are small, and I have plenty of yardage, so I can easily work around that. The lining is dark brown.